Our granddaughter Audrey celebrated her first communion today, and this grandpa was especially proud that she was chosen to be the reader for the Epistle lesson, or as the bulletin for the service said, to “Proclaim” I Corinthians 10:16-17. She isn’t tall enough to see above the lectern, but she read flawlessly Paul’s words so sorely needed in our broken world, “The cup of blessing that we bless, is it not a sharing in the blood of Christ? 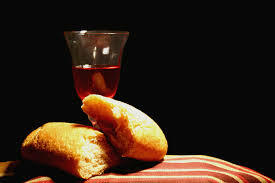 The bread that we break, is it not a sharing in the body of Christ? Because there is one bread, we who are many are one body, for we all partake of the one bread.” There were other references to unity in the liturgy and hymns for the service, and the Monsignor did a great job of coming down into the congregation to talk directly to the young communicants. He reminded them to enjoy the celebration with family and the gifts they would receive on this important day but stressed that the real gift they were about to receive for the first time is the gift of Jesus himself. He told them the best part is that they can receive Jesus anytime they choose to invite him into their lives. And then at the high point of the service these beautiful young children were invited to receive the sacrament of Holy Communion for the very first time, followed by the other members of the congregation. Except the invitation was not for the whole congregation. In keeping with Roman Catholic doctrine those of us who are not Catholic were not welcome at Christ’s table. We, even those of us who are devout Christians of other stripes, were excluded from receiving the gift of Jesus. I thought I was prepared for that part of the service. I’ve been in Catholic services before, but this was different. To be able to share in that sacrament with Audrey would have been special and to be reduced to a mere spectator was painful; and the irony of it all having just heard her read that “we who are many are one body, for we all partake of the one bread” hit me harder than I expected. Maybe it’s because I am already very discouraged and depressed about the hateful and divisive state of American society and the ratcheted up tensions between the U.S. and Russian and North Korea. Or maybe it’s just that I am still idealistic enough to believe that pious talk about Christian unity should translate into practice. That was 42 years ago, and the body of Christ is still broken. What kind of witness can the church possibly offer to a world starving for unity and peace when we Christians still can’t all feast at the same table? Please understand, I am not judging my Roman Catholic sisters and brothers, even though it probably sounds like it. This is not just a “Catholic” issue but an example of the brokenness in the church that we all must acknowledge if there is any hope of healing. As always I must remember Jesus’ advice to remove the log in my own eye before criticizing the speck in someone else’s. There are deep divisions in my own beloved United Methodist Church that may soon fracture the body of Christ yet another time. I am also painfully aware that Sunday morning remains one of the most segregated times of the week and that very few Christian congregations really reflect the rich diversity of our multicultural nation and world. My prayer is that all of us of every faith and persuasion will be more aware of anything we do as individuals or as organizations that divide us or exclude others and keep us from being one body in practice and not just in words.